If you frequently use your Mac laptop (or even a desktop Mac) to take notes during presentations, classes, or other live events, Pear Note is a clever alternative to a word processor or outlining program. 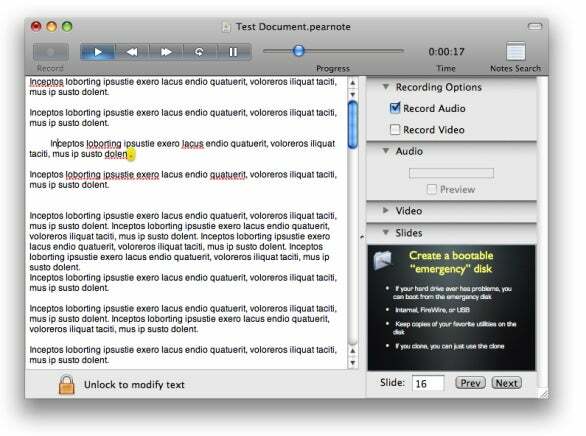 It provides basic text-editing functionality, as well as the ability to record audio or video. But what makes Pear Note special is how it combines these features into something uniquely useful. Pear Note’s main window provides a large text area with basic text-editing functions—spell-checking, custom fonts, styles, and colors—as well as the same list, link, spacing, and table features as OS X’s own TextEdit. The rest of the window hosts Pear Note’s recording features and settings. To the right you choose whether to record audio, video, or both. An audio meter shows the level of the current recording and a video panel lets you see the video being recorded. At the top of the window are the recording and playback controls. Simply click on the Record button to start recording, and then take notes as you normally would. Via Pear Note’s preferences dialog, you can choose the audio and video sources (for example, if you have both a built-in iSight and a DV camera connected), as well as the audio- and video-recording quality; you can also choose to have video flipped horizontally when recorded. These text-editing and recording options aren't groundbreaking. But Pear Note doesn’t just record audio and video. It also tracks the exact time in the recording that you typed each character of your notes. When you play back your recording, Pear Note “follows along” in your notes by highlighting the character you were typing at each moment. You can use the playback buttons, as well as the playhead (scrubber) slider, to skip to any part of the recording and see what you were typing at the time. But even more useful is that this also works conversely: If, while reading through your notes, you realized that you missed something that was said or shown, simply click on that place in the text; Pear Note automatically skips to that exact moment in your recording, letting you watch or listen to the desired portion of the event without having to manually scan through the audio or video to find it. Pear Note’s text-editing area has two modes, locked and unlocked. You use locked mode, which doesn’t allow you to edit text, to find a particular location in your recording. Once you’ve found that location, clicking the padlock icon at the bottom of the window puts you in unlocked mode, which lets you edit, but disables the click-to-position-playback feature. (You can control playback during editing using the playback controls or keyboard shortcuts.) When adding text to a note post-recording, that new text is treated—for the sake of playback—as if it was typed at the same time as the surrounding text. You can also use Pear Note to record an event and then add your notes at a later time; those notes will be synchronized with the recording just as if you’d taken them during the event. Similarly, you can import any QuickTime-supported audio or video file into Pear Note and then type notes as you listen or watch. If you import media into a Pear Note document that already contains recorded audio or video, you can choose to add the new media to the beginning or end of the existing media, or to replace it (for example, if you find a better recording of the same event). This linking of text with audio and video is immensely useful; I would have loved to have something like this when I was in college, and it's also valuable for business meetings, training sessions, or any other event where you might want a recording of the event to go with your notes. However, there are a couple issues with the way the feature is implemented. First, sometimes it’s difficult to follow along in the text during playback, because Pear Note highlights only one character at a time; I’d prefer if Pear Note highlighted the entire line containing the current text, with a more-obvious highlight for the current character. Similarly, Pear Note doesn’t auto-scroll the text area when the cursor travels beyond the visible text; you have to manually scroll to keep up. Pear Note also includes a couple useful features for organizing and accessing notes. The first is an option to automatically generate names for your Pear Note documents based on the date and time of creation. The second is a handy browse and search function: By opening the program’s Search window, you get a list of all Pear Note documents, sorted by modification date; clicking on a document displays a preview of its text. Alternatively, the windows’s search field uses Spotlight to let you search the text contents of all Pear Note documents. On the other hand, for a program aimed at taking notes, Pear Note’s outlining capabilities are fairly limited, and no better than those of TextEdit. For example, if you indent a line—say, to make that paragraph a “child” of the previous paragraph—the new text wraps flush left instead of to the indent. It would be great to get some basic outlining capabilities such as automatic formatting and indenting, as well as keyboard shortcuts for various text styles. Once such features are added, and the follow-along text highlighting is improved, I’ll be able to recommend Pear Notes to anyone who needs a better note-taking tool. But even now, it’s a unique program that many people will find useful.